Honda Siel Cars India Ltd., leading manufacturer of premium cars in India, today launched an 'Exclusive' variant of the Honda City, with several new interior and exterior luxury features. The introduction of the exclusive variant is a step further in Honda’s commitment of providing something special to Honda loyalists during the festival period. The new variant is an addition to the City line-up, offering a distinctive combination of refined styling and high quality. The additions of leather seats and leather steering in MT and AT and leather gear shift knob (only in MT) enhances the feeling of luxury and elegance of the car. Adding to the stylish and trendy look of the car is a Chrome trunk garnish and Chrome door sash moulding along with an 'Exclusive' rear badge and Body coloured mud flaps that enhances the ownership experience of the Honda City 'Exclusive'. With this, the Honda City range also gets a new colour- Urban Titanium - apart from the existing colours- Taffeta White, Alabaster Silver, Crystal Black Pearl, Bold Beige Metallic and Habanero Red. Speaking on the occasion, Mr. Tatsuya Natsume, Director Marketing, Honda Siel Cars India Ltd. said, “Honda City is one of the most successful and desirable brands in the country. The ‘exclusive’ variant is aimed at further delighting our customers with exclusive luxurious features during this festival period.” The current Honda City is a winner of 12 Auto Awards including the most prestigious ‘Indian Car of the Year 2009’ (ICOTY) Award. The new Honda City’s instant success is testified by the fact that it has sold nearly 54,000 units since its launch in September last year. 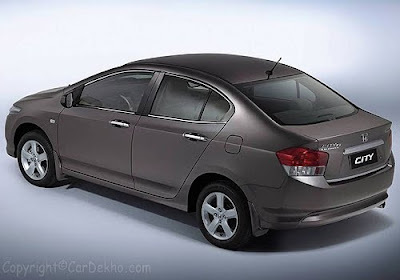 Price of the Honda City 'Exclusive': V MT - Rs. 9.53 lakh and V AT – Rs. 10.25 lakh (ex-showroom Delhi).